There is a natural ebb and flow to magic. When the tide of magic is high, its potency goes up, dormant magic comes back alive, the amount of people who can channel it goes up, and the fabric between the planes grows thin. At low tide, magic is weak, certain magic goes dormant, only the most sensitive people are able to channel it, and the fabric between the planes becomes almost impenetrable. For aeons Gaea has been experiencing a low magic tide, resulting in far fewer arcanists (e.g. mages, sorcerers and warlocks), far fewer demons and supernatural creatures, and an overall loss in the understanding of powerful spells, enchantments, dweomers and artifacts. Some magical artifacts went fully or partially dormant, the power infused within unable to be sustained by the levels of magic. Tomes, grimoires, heirlooms and artifacts that no longer functioned were stored away for future generations, to be revealed when Gaea saw a high magic tide once again. Over time, some of these vaults and caches were forgotten or lost. People’s memory of powerful magic have faded and made place for superstition and fear. Hermits, mystics, druids, pellars, witches and crones are often shunned in polite society, mostly because they are considered frauds. They find their homes on the edge of small villages, secluded rural areas or deep in the woods. The local peasantry, superstitious and trying to make their way in life with few means, often turn to these people for help. They fear them, but at the same time revered them for the help they can offer. But their help doesn’t always work, and many a mystic has been burned alive in angry retribution to a failed ointment, powder or salve. The szygani, travelling families from the contested isles in the south-east of the Verdant Kingdoms who follow the old gods and seemed to have a closer connection to the magics of the past, are mostly feared. With their strange ways, their unusual customs, their different tongue and appearance, they are known to curse anyone who crosses them. More often than not their curses come true, and so the fear for them grows, but also their reputation. Only the fearless and desperate approach them for their help. So now, arcanists, already rare, have a far harder time achieving the same results as their predecessors. It means that accomplished arcanists are even more rare, since most do not have the ability, ambition, dedication or lifespan to reach those legendary heights. But slowly the tide of magic is starting to turn, and Gaea is slowly changing. Soon, magic will be more common place, and with the coming of magic, so will come the creatures and demons. People who had started to believe that the legends were just stories to frighten each other with while sitting around the hearth fire will have to quickly come to terms with a world that’s rapidly becoming more dangerous. The ebb and flow of magic also effects the people of faith (e.g. clerics, paladins, druids, rangers). The intuitive connection they share with their patron is weakened as significantly as an arcanist’s connection to magic. As a result, when the tide of magic is high, and people of faith are at the height of their abilities, churches and temples are full with believers. The reverse is true at low tide. People shy away from churches and choose to congregate at home, with family. Belief doesn’t wane with the waning of magic, just trust in the institutions and its representatives. Three moons appear in the night’s sky, a bright silver one, a blood red one, and a barely visible blue moon. There are many stories and superstitions about the moons, most of them wildly inaccurate. One thing that few people are aware of that is actually true is that the phases of the moons affect the efficacy of magic. The largest and clearest of the three moons is called the Silvermoon. It appears as a great, silver orb in the night’s sky which sheds a brilliant, crystal clear light when it is prominent in the heavens. The szygani refer to it as Lačhi, one of the old gods. It is the patron of all good-aligned spellcasters. The silvermoon’s cycle is the longest of the three moons, lasting for 36 days from full moon to full moon. Its high and low sanctions last for five days, while its waxing and waning phases last for 13 days. The second largest moon is the Bloodmoon and it appears in the night’s sky as a startlingly deep red orb. The szygani call this moon Maškar and it is the matron of neutrally-aligned spellcasters. The bloodmoon cycle takes 28 days to complete, with a high and low sanction that last three days each, while its waxing and waning phases take 11 days to complete. The smallest and faintest of the three moons is the Darkmoon. It gets its name from it’s midnight blue colour, which makes it hard to distinguish from the night’s sky. The szygani call this moon Nasul and they believe that it’s the matron of all evil-aligned spellcasters. The darkmoon is on the fastest cycle, lasting only eight days. It only remains in high and low sanction for a day, and it’s waxing and waning phases last for three days each. There are four phases each moon occurs in, as illustrated above; waxing, waning, high sanction and low sanction. Depending on the length of a moon’s cycle, the length of each phase varies. Each phase has several effects on a caster’s spell or prayer as described below. *Only available to spellcasters of 6th level or higher, with a primary ability score of 15 or higher. When two moons are in alignment, meaning that two moons are both full, they strengthen each other’s effect. When all three moons are in alignment, they call it the Night of Three Eyes, and the three moons boost each other’s effect on magic even further. Note that the moon bonuses from phase and alignment are cumulative. Similar to the phases and alignment of the moons, the winter and summer solstice as well as the spring and autumn equinox has a profound effect on the power of both arcane and divine magic. Both the equinoxes affect neutrally-aligned spellcasters, while the summer solstice affects good-aligned spellcasters and the winter solstice affects evil-aligned spellcasters. Note that the solstice and equinox bonuses are cumulative with the moon phase and alignment bonuses. There is a common trade language which is spoken across almost all of the Verdant Kingdoms. It’s a formal version of Lyrian, highly adapted and streamlined in order to be learned and picked up quickly, while still providing enough flexibility and nuance in order to make due in most situations. One can go anywhere in the Verdant Kingdoms and have a reasonable expectation to be understood while speaking common Lyrian. Only small pockets of wildermen on the independent and contested south-eastern islands off the coast of Mazuria have refused to adopt the language. Also there are some hard-line Daerlanian expansionists who have refused to speak it, preferring to push for High Daerlan to become the dominant language across the kingdoms, and certainly across the empire. The same calendar is used across the Verdant Kingdoms. There are twelve months, each of thirty days, divided up equally in three rides of ten days. After every two or three months, a special day of celebration would occur that would stand outside any rides or months. The year is 1262. It has been a little over fifty generations ago that all the twelve Verdant Kingdoms agreed upon and adopted year zero as the start of the verdant calendar. It was during a time of relative peace and stoic reconstruction after the last conjunction when the long waning set in. 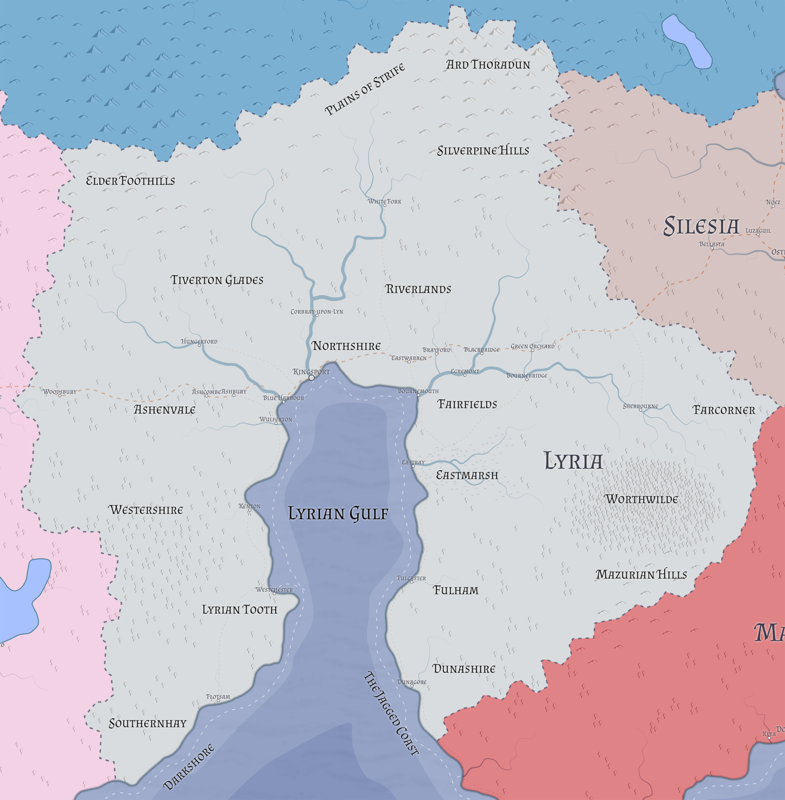 The Kingdom of Lyria, click for a higher resolution image. Lyria surrounds the Lyrian Gulf like a horseshoe. The gulf is 50 leagues (250 km) from the northern most shore until the deep waters of the outer gulf. It’s 26 leagues (130km) at it’s broadest on the inner gulf, just north of Kenton to just south of Eastray, and 13 (65km) leagues at the mouth of the inner gulf, from the Lyrian Tooth to the eastern shore south of Fulcaster. The kingdom is 112 leagues (560km) from its eastern most point, on the three kingdom border with Silesia and Mazuria, to it’s western most point on the border with Beauclair. Remarkably, it’s 112 leagues from its northern most border straight south until it reaches the latitude of its southern coastline. The total land mass is 7007 square leagues, making it the third largest kingdom on the continent behind Beauclair and the Daerlan Empire. The economic heart of the kingdom, Northern Lyria has some of the most fertile and sought after lands. Kingsport is the largest port, the largest city and the seat of the royal court. This means that every ambitious noble house worth its salt has a presence in Northern Lyria, with an exception of a few ancient mainstays who are such a part of Lyria that they no longer have to worry about jockeying for position at court. It is the richest part of Lyria. The northern mountain range of Ard Thoradun is named after the hidden fortress city of Caer Thoradun, home of clan Thoradun. The Thoradun mountain dwarves are the only people capable of withstanding the harsh environment of Lyria’s tallest peaks and harshest weather, and the only people brave enough to battle the wyverns, frost giants and other supernatural creatures that inhabit the Thoradun mountain range. Regular caravans of traders descend down the mountain to resupply the mercenaries on the Plains of Strife and bringing their goods to White Fork for sale and transport downriver. The Thoradun metalworks are praised throughout the Verdant Kingdoms and their masonry is sought after by all of the noble families. The hills in the north-west of Lyria, east of Beauclair and south of the Daerlan Empire is named so for the many abandoned elven ruins that can be found there. Several settlements can be found filled with mostly hill dwarf prospectors, elven sorcerors and opportunistic humans. The hill dwarves are excavating the ruins, the elves are searching for their history and lost artifacts, and the humans are mostly Lyrian scholars and Beauclairois dilettantes. The most populated region of all of Lyria is nestled along the northern coast. Here, countless noble houses compete and clash over valuable coastlines and fertile farmlands. Kingsport is the seat of power and the largest port on the Lyrian Gulf, and ambitious noble houses want to get a piece of the influence and wealth that is available there. As a result, there are twice as many noble houses in Northshire than there are in the rest of Lyria combined, the largest of which command unbelievable wealth and power. The Silesian Road leads east away from Kingsport, all the way to Silesia, and the Beauclair Boulevard leads west towards Beauclair. The quality of these two roads varies from place to place, but in Northshire, they are both neatly cobbled and well-maintained, with sign-posts at every intersection indicating how many leagues to the next important town or city. Officially the Daerlan Empire isn’t infringing on Lyrian sovereignty, but regular incursions are rebuffed on the Plains of Strife. The area is flanked to the east by the Ard Thoradun and the Elder Foothills to the west, forming a natural valley heading south to the Riverlands. From the border it is a straight corridor of easy terrain to one of the three parts of the river Trident. Once the river would be reached a hostile force only has to overcome the garrisons at White Fork, a small town on the Trident in order to sail all the way down to the river Lyn and to Kingsport. As a result of this constant and imminent threat of invasion the Plains of Strife are sparsely populated, despite the pleasant hills, grasslands and plenty arable land. Several mercenary companies have a heavy presence in the area, as well as several semi-permanent hosts of fighting men on retainer to some of the more patriotic lords of the Riverlands and Northshire. It’s an isolated part of Lyria where lots of men have lost their lives. 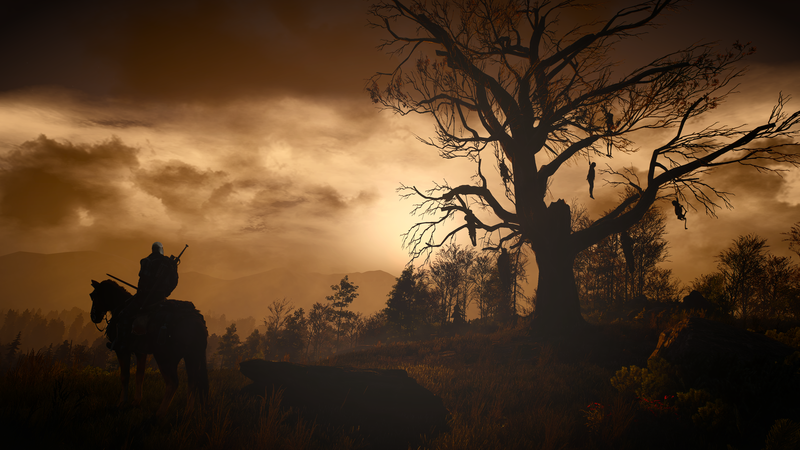 Packs of scavengers, carrion crawlers and necrophages can be found prowling old battle fields. They are a plague to the camps and rare villages on the Plains of Strife. The Riverlands are bordered by the Trident, the river Lyn to the west and the river Teign to the east, Northshire to the south and the Silverpine hills to the north. It is dotted with small hunting and farming communities, isolated from one another by woodlands and rivers running from the Silverpines to the gulf. The people are honest, hard working and enjoy simple pleasures. They are more prone to follow the old gods than the rest of Northern Lyria, likely due to their connection to the woods. The ability to straddle the line between woodlands and farmlands draws many half-elves to settle in the Riverlands, where they are often appreciated as excellent woodsmen. The Silverpine hills, or the Silverpines as they are affectionately called by the locals, are the foothills to the south of Ard Thoradun, just west of the Silesian border. Densely wooded, the region gets its name for the steady amounts of snow that comes down from the mountains and dusts pine trees. The people that live in the Silverpines are industrious and joyous. A surprisingly high number of promising students and professors at the Bournemouth Academy are from the Silverpines and they take enormous pride in perfecting whatever trade they decide to take up. Not unsurprisingly, the noble houses hailing from the Silverpines are some of the liberal in terms of the freedoms they allow their people. The upward mobility of serfs and peasants in this area is by far the highest in Lyria, provided they can excel at something, which isn’t always easy to prove, but most lords and ladies offer the opportunity to those who are willing to grab it. 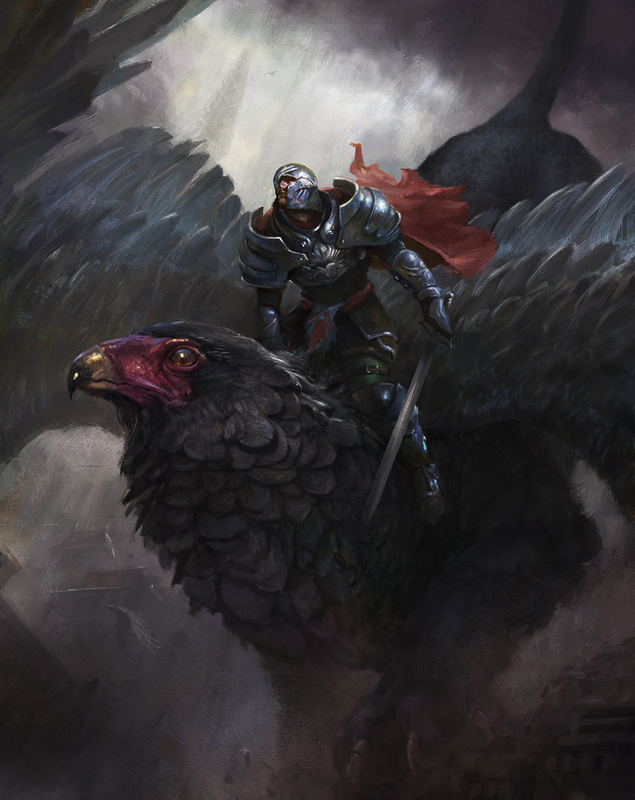 The fortress of Gryphon’s Roost, home to the renowned Order of the Gryphon makes its home in the northern part of the Silverpines. North of the Polivar river and west of the river Lyn, rolling all the way to the Elder Foothills, are the Tiverton Glades. A beautifully wooded area, rich with game, streams and ponds. The soil is fertile so many small farming communities make their home in Tiverton. Tivertonians consider themselves blessed to live in such an idyllic part of the kingdom, while the rest of the kingdom looks upon them as soft and lazy people who never had to work for anything. Many of the Northshire nobility have small keeps in the Tiverton Glades, using it as a retreat from the precarious life at court. They hunt, spend their days picnicking around the ponds and organise masquerades at night. The Tiverton Glades are very well protected. While the protection level is as high as in Northshire, the area is significantly larger and hiding out in its woods is much easier. This has meant that on occasion, outlaws, brigands and bandits have used its woods to hide out in, capturing the small keeps only protected by a skeleton retinue of guards. This was always met with a very swift and united response from the nobility, who learnt how to work together in the Tiverton Glades despite being at each other’s throats in Northshire. Outlaw activity has since significantly died down. The eastern part of Lyria likely has the most diversity of terrain; from the marshlands of Eastmarsh, to moors of Dunashire, to the golden farmlands of Fairfields, to the Mazurian hills, to the dark, impenetrable forests of Worthwilde, to the desolation of Farcorner. The coastal area of Dunashire is very exposed to high winds and therefore has wilder nature with sheer cliffs made of granite which rise up to 300 meters at the highest point. Behind the cliffs, the exposed upland is rugged and infertile with grass- and moorlands. The cliffs are sheer but occasionally open up for small fine sand beaches, small rivers and estuaries, offering safe anchorage. Due to the rugged nature of region, it’s sparsely populated. Those who live there either live off sheep herding, a tradition they share with their northern Fulham cousins, or off the sea. Dunashire sailors are renowned as great sailors, having been brought up knowing how to navigate the treachery of The Jagged Coast. The Dunan river that gives the region its name has taken countless generations to etch itself into the granite bedrock and carve a path to the coast just south of Dunagore. The city of Dunagore sits at the top of a small, 110 meter cliff. At the bottom, near the mouth of the river Dunan, there is a stretch of beach. Large steps have been carved into the rock going all the way from the beach to the top of the cliff. There are exactly 333 steps, each 33 centimeter tall and 3 meters deep and 3 meters wide, going back and forth in a zig-zag exactly three times, for a total distance of 999 meters. At high tide, the beach is drowned out by the sea. At low tide, it allows access to Dunagore Mount, a tidal island off the coast of Dunagore. An artificial causeway of carved, granite blocks, 3 meters wide and 3 meters deep, 333 in total is accessible at low tide. The island stands at a little under 33 acres. Dunagore Fortress, which sits atop Dunagore Mount, is a heavily fortified fortress. While its style has a lot in common with the fortress at Fulcaster, it seems it was made for people standing much larger in height. Doorsways are larger, hallways are taller, etc. Who built Dunagore Fortress the causeway that connects to the mainland, or the steps in the side of the cliff, is a mystery to scholars. There are many theories, but none of them seem to have enough evidence to support them. It is considered a wonderous and mystical place. Many people make pilgrimages to Dunagore to walk the causeway and visit the mount, believing that it was once the home of Paladine himself. Currently, the Order of the Shield makes its home at Dunagore Fortress. Due to the natural currents in the Lyrian Gulf, the waters off the eastern shore is noticeably colder than its western twin. The resulting precipitation makes the area of Eastmarsh a very dreary place. The swell of the rain water makes the Ivel river a fast moving river until it gets to the coast where a reef in the gulf blocks the river from shedding its water. Due to the sudden slowdown of the river, all of the sediment gets deposited before it reaches the gulf, over time further blocking its watershed. The resulting delta around Eastray has caused much of the hinterlands to turn into a large marshland. The soil is very fertile, but hard to work. The soggy foundation also means that there is a lack of woodlands in the area, which means that settlements and engineering projects are hard to erect. Instead, freshwater fisheries, sugarcane farming and cultivating rare, herbaceous plants. People from Eastmarsh are referred to as “marsh dwellers” or the less friendly “mud men” or “frog eaters.” They got the latter nickname due to their propensity for supplementing their diet with fish, frogs, grubs and lizards. This as a result of their inability to keep cattle due to the soggy ground. They shun armour and heavy weapons, preferring spears and tridents, and they are rumoured to poison their weapons and arrows. The marsh dwellers are clannish, dour and xenophobic and are considered “odd” by other Lyrians. They talk in thick accent and tend to be more superstitious than the rest of the Lyrians. Eastray is a small city on a hillock in the mouth of the delta and one of the few larger settlements. Most of the houses inside the city are made of the traditional logs and thatch because the ground simply can’t carry the weight of any stone constructions. The rest of the settlements throughout Eastmarsh are much the same. Some families live on large, log pontoons. South of the river Bourne lies a very fertile piece of arable land by the name of Fairfields. Many thriving farming communities have been established here, which supply most of the Lyrian demand for wheat, barley and oats. The orchards are renowned for their ciders and fruits, and the breweries make high grade spirits, ales, meads and beers. There are a few vineyards that make decent wines, but they pale in comparison to the Beauclairois wines. Wind- and watermills dot the landscape and carts haul harvests up to Bournemouth, Egremont and Bournebridge for distribution throughout the kingdoms. Various noble and merchant houses have a stranglehold on almost all available land here, but ownership of farmsteads and farmholds are constantly changing as they get traded, bartered and swindled between houses. Experienced Fairfields farmers and farmhands are sought after throughout the kingdom for their skills and abilities. The three kingdom border of Silesia, Mazuria and Lyria is the furthest point away from the seat of power in Kingsport, at roughly 68 leagues. Sherbourne is the closest town to Farcorner, but there are only a few small villages in the region. The area is lightly wooded and due to its desolation the home to several tribes of savage races, like orcs, goblins, ogres and gnolls. Fulham is an unremarkable region of Lyria. It’s not moderately populated and has a lot of cattle ranchers that keep mostly sheep. There is lively wool production and as a result the weaving is of the highest quality. Many of the nobility commission the weavers guild in Fulcaster for tapestries for their halls. Linen production is also common, and as a result, so is paper production. Most of the people in Fulham live close to the river Wye. Fulcaster is the largest city, which is set on the foundation of an ancient fortress the origins of which are lost in history. Legends have it that a large battle was fought just south of Fulcaster, the remnants of which sometimes can still be found when a new field is plowed. Old weapons and armour are found, as well as bones from men, elves and dwarves alike, as well as some large, horrible looking beasts that can no longer be identified. People from Fulham are considered hard working, hard-nosed and no nonsense. They work hard, drink hard and fight hard. Travelling shows often have strong men from Fulham, who challenge anyone to wrestle or fight for the chance of winning a silver stag. The Mazurian Hills are located directly south of the Worthwilde. Straddling the border with Mazuria, the hills are lightly wooded and quite desolate. Few people have settled in the hills except a clan of hill dwarves by the name of Clann Dearg Carraigh, or Children of the Crimson Rock. The south-eastern coast of the Lyrian Gulf is rugged and treacherous and only navigable by the most experienced captains. Rough granite rocks stick out from the water like teeth, but the real danger lies below the surface where the rocks hide from inexperienced sailors. The Worthwilde, or the Wilde, is a region of Eastern Lyria that is fully covered in very dense woods. It is flanked to the south by the Mazurian Hills and to the east by the plains of Silesia. The western part slowly changes from woods to the bogs and marshlands of the Eastmarsh and there is a fairly clear and hard border with the river Bourne to the north. It is called the Worthwilde because of the potential timber that could be harvested from the area if it wasn’t for the Aen Canell, or the People of the Oak, as the wood elves like to call themselves. They are fiercely protective of the forest and have declared war on anyone who dared to threaten it. The royal Valois family has brokered a peace treaty with the Aen Canell long ago that they are not willing to break, but devious lords and thieving commoners have occasionally dared to enter the forest. Few have ever made it back and those who did came back with their mind shattered, incapable of coherently recalling what happened to them in the dark depths of the Worthwilde. Some courtiers have suggested that such a passively hostile force inside the kingdom is dangerous, but the royal family has always insisted that the faith between the kingdom and the Aen Canell was not to be broken. The Aen Canell have a city somewhere in the forest which they call the Duén Gwyndeith, or Palace of the White Flame, named after the ruler of the Aen Canell, Gwyndeith, who is also known as Hlaith N’Deireadh, or Lady Without Ending. Legend has it that she is immortal and vividly remembers the time before the Great Waning, when legends still walked the Verdant Kingdoms. Probably the least populated part of Lyria, the west has some of the oldest and proudest houses in the kingdom. The people of the west are fiercely patriotic and chivalrous, and believe in Gods, Queen and Country. South of the Polivar river, Ashenvale is a large valley filled with ash trees, giving the valley its name. The only river in the area is the river Baugh, which flows into the gulf at Wulferton, the seat of House Grey, an old and important house in the Lyrian peerage who have been dominant in Ashenvale for centuries. Even Blue Harbour, a larger port city on a larger river doesn’t have the same pull as House Grey of Wulferton. There are two small keeps along the Beauclair Boulevard, Ashbury and Woodbury, strategically protecting the vale from both sides. These keeps have become less important now that relations with Beauclair are warm and cordial, but the people of Ashenvale have not forgotten their sacred charge of protecting the western border in case these relationships shift suddenly. In autumn, with the fading sets in, the ash trees of the vale turn bright colours of orange and red. Many Lyrian artists have marveled at the remarkable and dramatic shift from green to red in only a few short weeks and have tried to capture it in song and paintings, but it is said that all Lyrians should witness autumn in Ashenvale at least once in their lives. The western shore of the gulf, as well as the western part of the shores off the southern sea are much warmer in temperature and milder in temperament than the eastern part. The coast at Dunashire is very rugged, but the shores off Southernhay are mostly fine sand beaches, with a few treacherous reefs here and there, but much more navigable than its cousin. The reason for its ominous name is due to the amount of pirate activity along that coast. There are many coves and places for anchorage that allow for ambushes. 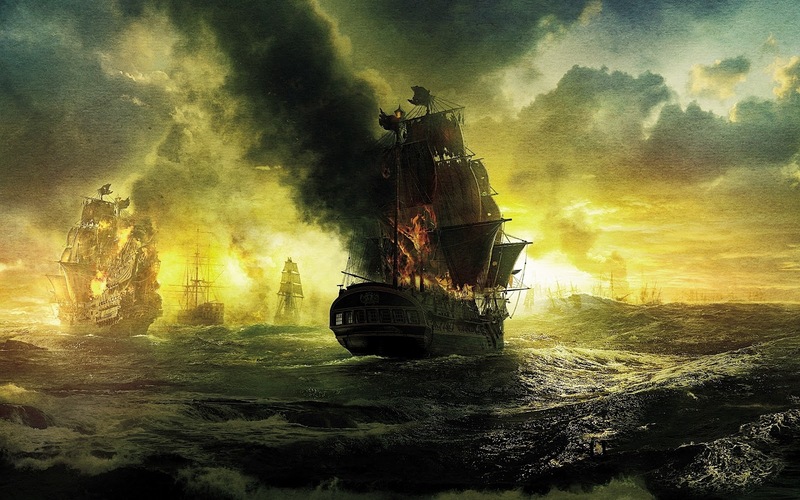 Long ago the Lyrian fleet fought a severe naval battle against the Càrceres armada, which left the shore littered with shipwrecks. There are regular claims of ghostly ships and strange lights seen off the coast, but nothing which has been substantiated. Occasionally, divers go hunting for the treasures of the many ships under the waves. The region of Southernhay is a popular retreat for elderly lords and ladies due to the warm climate. The gently rolling hills are also a prime location for vineyards, and several Beauclairois families have invested heavily in the development of the area. It’s not unusual to find small villages and vineyards run by people not speaking the common Lyrian tongue. This has caused some concerns with the Lyrians in the area, resulting in some skirmishes, fights and ongoing feuds. The Darkshore is a known resting place for many Lyrian and Càrceres ships who fought each other in a naval battle several generations ago. Those and the havoc the pirate wreak along the coast are a regular cause of debris washing up on the beaches or getting caught in gyres off the coast of Flotsam. It’s such a regular occurrence that debris washes ashore that it gave the city of Flotsam its name. Technically part of Westershire, the Lyrian Tooth is a strategic area along the western coast of the Lyrian Gulf. It hides Westchester, the largest city in Westershire, from anyone sailing up the gulf. As a result, the Lyrian fleet is at anchor in the Westershire bay and keeps tight control to the inner gulf and Kingsport beyond. Between the fortification of Dunagore Fortress, and the fortifications on the Tooth, the Lyrians feel that the inland waters of Lyria are well defended. As a result of the presence of the fleet and the soldiers on the Tooth, the coastal area of Westershire, especially around Westchester, is high in soldiers and mercenaries looking for work. This is also the place for merchant vessels to take on protection before they sail into less safe waters. Most of the mercenaries that are found on the Tooth are older and more experienced than the glory seekers that roam the Plains of Strife in the north, but the gold that a soldier can earn on the Tooth is also significantly less than on the Plains. The largest region in the west, Westershire is known for producing the best tournament knights, supplying the most troops to the Plains of Strife, and fiercely supporting the Order of the Lance at Ironrath Keep, deep in the heart of Westershire. What is unique about Westershire are the Ironwood forests that occupy large parts of the region. Ironwood is incredibly hard wood which is highly valued for spears, shields and lances. It is also sought after the by the shipwrights guild for use as masts. Not only is ironwood incredibly hard, it is also incredibly difficult to work. It requires patience, skill and exceptional tools. Westermen have been doing it for generations and are renowned throughout the Verdant Kingdoms for their ability. Due to the valuable resource, a few very rich and ancient houses have been trying to outmaneuver each other to gain control over the biggest forests. Even though logging is a large part of the business in Westershire, everyone there knows that if they cannabalise the groves, the next generation won’t be as fortunate as they are, so they are very careful not to harvest too many trees each season. This has also driven the price for ironwood up, and some merchants and nobles have complained about the stranglehold the Westermen have over the trade. The cultures of the Verdant Kingdoms are varied, and so are the gods the people worship. Below is a description of each of the occurring patheons, their gods, portfolio’s, alignments, symbols and their suggested cleric domains. Where necessary there might be some notes on the way the gods are worshiped, or where. Beauclair, Lyria and parts of Silesia share the largest pantheon of gods. Below is a small selection of the most important ones. There are many more. Paladine and Takhisis are siblings. They are both also known as Bahamut and Tiamat, or the platinum and chromatic dragon. In that form they are also worshiped by dragons and the dragonborn. The northern countries of Miðgarður, Hellmark and Fintra worship a set of deities who are closely aligned with nature, oftentimes brash, tempestuous and impulsive. In Kaedwyn the gods are considered legendary people who long ago ascended to immortality and godhood. They are called the Tuatha Dé Danann, or Tribe of Gods, who long ago roamed the lands. The Daerlan Empire and Mazuria most people are monotheistic and follow Deus. Silesia is generally also considered monotheistic, but it is much more diverse and accepting of other beliefs. There are aspects of good and evil that some people pay homage to, but those are represented by angels demons in service of Deus and Asmodeus. The old gods are hard to describe. To those who worship them, mostly wildermen in the south-east of the Verdant Kingdoms, and the szygani that roam the lands and swear no fealty to anyone but their family, they are more like forces than actual personalities. They have no real names, but people who worship them still have a close, personal relationship with them. They are called the Čhonči, or the moons. There are aspects of good, evil and neutrality that some people pay homage to, but those are represented by spirits and demons in service to that alignment. The elder races have pantheons of their own. Below are some of the elven and dwarven gods. Their pantheons are small, but have many demi-gods who are usually legendary figures who became champions to one of the gods and were awarded for their deeds with ascension. Knowledge of the drow and the Dark Seldarine pantheon is very limited even among the elves.